There's a lot of fear-mongering in the media about the impact of the U.S. drought on food production and what that means for the future. A look at the crop supply data, available from the USDA feed grains yearbook, tells the full story, and it is not about food, nor is it entirely about the drought. The U.S. shifting from fueling animals with corn to fueling cars with corn. I wrote about this a few years ago in a piece in Momentum Magazine, and my colleague Chris Kucharik and I alluded to this inevitability in our 2008 paper on corn ethanol production and the Gulf of Mexico 'Dead Zone'. Corn production has close to doubled since the early 1980s due to technology, fertilizer and the like increasing crop yields, and to an ethanol-driven increase in planted area over the past decade. Thanks to the increase in production, the U.S. was, until a couple years ago, able to produce all the corn ethanol without really denting the total amount of feed produced (or the amount of what I've labelled sweeteners and others, which includes high-fructose corn syrup, seeds, glucose / dextrose, floor waxes, xathan gum, pens, lecithin, breakfast cereals, adhesive tape, etc; OK, I admit, I made one of those up, but seriously, only one, and I could be wrong, that one may actually come from corn). 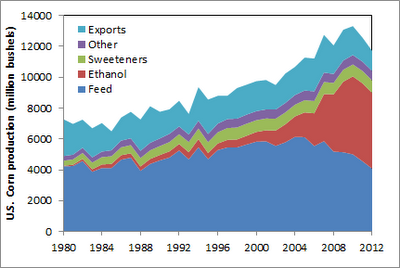 Now, ethanol production is coming at the expense of feed and exports. Last year, feed production was the lowest since 1995, which was a low corn production year, and exports were at the lowest since 2006. 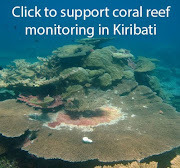 In the 2008 paper, we predicted this would happen simply because of land availability. There's only so much productive cropland not already needed to for other grains and oils that can be used to produce high-yielding corn. 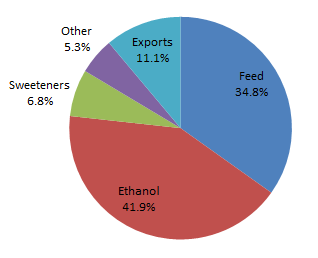 In order to reach the goal of 15 billion gallons of corn-based ethanol per year, corn would have to be diverted from its other major uses, namely feed and exports. I'd like to claim I was brilliantly prescient, but the math was pretty straight-forward (though very very time-consuming to do properly, a reminder that science is often about the grunt work, not the exciting discovery). This year, despite the devastating drought, there's still plenty of corn being produced. Total corn production is right at the level of the middle of the last decade (the 2003-2007 average, to be precise). The supply issue is about ethanol, which is expected to use up almost 42% of this year's corn crop (figure at left). The drought is exacerbating the effect of ethanol production on the availability of crops for other uses. According to the USDA's preliminary estimates for the 2012/2013 crop year (the last set of data on the chart above, listed as 2012 for convenience), the drought will drop overall corn production by about 13% from the previous year, but ethanol production will only drop by 3%. Feed production will be the lowest since the 1988 drought, a low level not generally seen since the 1970s. Similarly, exports will be the second lowest since 1980. The tight supply of feed and decline in exports, together with speculation about those same two things, is affecting prices, which can in turn affect food availability in other parts of the world. There's been much talk of whether this year's drought and any impending price-driven food crisis can be linked to climate change. That's impossible to answer definitively. Instead, we should think about the following: This year is an example of how poor climate change mitigation decisions - corn ethanol production, an answer that was looking for a question - can make the world less resilient to climate change. Posted by Unknown at 2:12 p.m. I like your analysis, but I think you're missing something. Downstream on the ethanol value chain, dried distiller's grains (DDG) constitute a major secondary source of feed grains in the US. Roughly 17/52 by mass of a bushel of corn goes into distiller's grains, which the USDA noted can be substituted for corn at a rate of 1 pound distiller's grains per 1.22 pounds corn due to the higher nutritional content of DDG. Taken in this context, feed actually hasn't been displaced as much as you observe from the graph. I wrote a slightly amateurish post on my own blog with some graphs demonstrating the lack of significant changes in corn and corn derivatives going to feed use from Q1 05/06 to Q3 11/12, the time period that shows the largest expansion in ethanol use. I encourage you to read it. That's a fair point. In the analysis for the 2008 paper I mention, we looked at how the use of DDGs as feed grains can offset some of the decline in feed availability that comes from shifting corn over to ethanol production. So, you're right, the quick analysis in my post does overstate the feed stock situation, since there's a ~30-40% feed bonus from ethanol production. Though that still does not bump feed production up to the levels it was add five years ago. Interesting post and comments above. There remains a legitimate question of whether or not less corn available for cattle feed is a problem. I like my beef grass fed.